The President's daughter has been kidnapped by ghosts. As Spotto, you head into the haunted house and must take out all of the ghosts by throwing bombs into their open mouths. Spotto stays rooted to the spot. 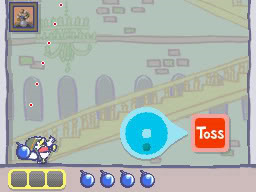 Using the dial, change the angle of the throw and press the button to throw the bomb. You only get a limited number of bombs with which to clear each stage. Ghosts will open and close their mouths, so as well as aiming you must time your throws carefully.